A famous Abraham Lincoln photograph will be presented to the Marshall County Courthouse on Tuesday, September 4. The unveiling ceremony will take place at 1:30 p.m. at 122 N. Prairie St., Lacon. The photograph was taken in Springfield by well-known photographer Alexander Hesler on June 3, 1860, for Lincoln’s 1860 presidential campaign. Historians consider Hesler’s portrait one of the best taken of Lincoln during his pre-presidential years. The permanent installation is made possible by donations from the Illinois Judges Association Famous Portrait Of Lincoln To Arrive At Marshall Co. Courthouse (IJA), the Illinois State Bar Association (ISBA) and their respective foundations – the Illinois Judges Foundation and the Illinois Bar Foundation. Printed on canvas, the image of the beardless Lincoln is encased in a richly stained wood frame and measures 30-inches wide by 40-inches tall. 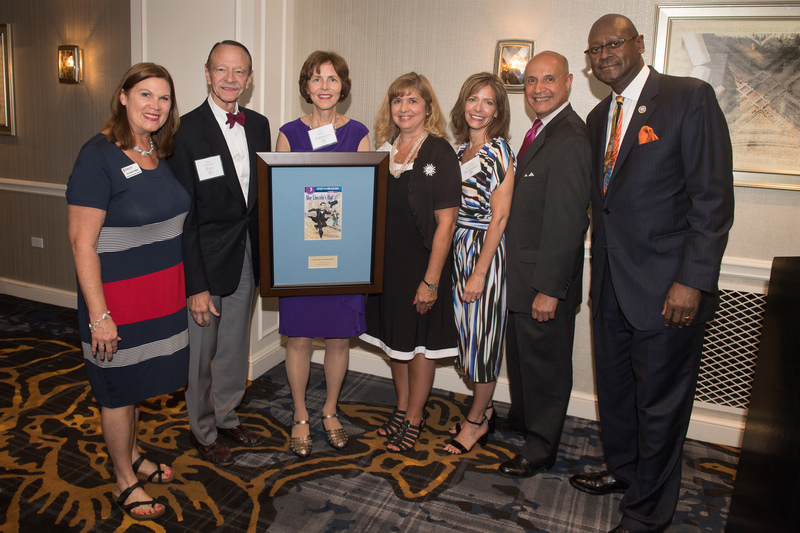 Pictured are Judge Debra Walker-IJF Treasurer, Judge Sebastian Patti, Judge Rebecca Pallmeyer, Judge Diann K. Marsalek-IJF President, Judge Janet Adams Brosnahan-IJF Scholarship Committee Chair, Judge Louis Berrones and Justice P. Scott Neville. On August 16, 2018 the Illinois Judges Foundation (IJF) presented awards and scholarships at their Annual Summer Reception held at the Hotel Allegro in Chicago, Illinois. Awards were presented to Judge Rebecca Pallmeyer of the United State District Court, Justice P. Scott Neville of the Illinois Supreme Court, Judge Louis Berrones of the Lake County Circuit Court and Judge Sebastian Patti of the Circuit Court of Cook County. All award recipients were presented with a framed book of Abe Lincoln’s Hat, a book read to young children by Judges who visit classrooms throughout the State of Illinois. The award recipients were recognized for their mentoring and others contributions to the legal community. In addition, the Harold Sullivan Scholarships were awarded to students from Loyola Law School, Hannah O’Keffe and Niclle Provax. Each winner will receive a scholarship worth $10,000.00, after applying matching donations from Loyola Law School. EFFINGHAM — In another way to commemorate the Illinois bicentennial celebration this year, a reproduction of a famous Abraham Lincoln photograph was unveiled at the Effingham County Government Center Friday. Measuring 30 inches wide by 40 inches tall, the image printed on canvas is that of the beardless Lincoln. The photo was originally taken on June 3, 1860, in Springfield by photographer Alexander Hesler. The large portrait will be hung in Courtroom B of the center, located at 120 W. Jefferson, Effingham. The image was used for Lincoln's 1860 presidential campaign and was considered by Lincoln to be his favorite photograph, said Fourth Judicial Circuit Chief Judge Kimberly Koester. The portrait is part of an effort to have a wood-framed copy in each of the 102 counties in Illinois by the end of this year to commemorate the state's bicentennial. The Effingham portrait was made possible by donations from the Illinois Judges Association, the Illinois State Bar As, the Illinois Judges Foundation and the Illinois Bar Foundation. Thirty-two counties stepped forward to sponsor portraits without the help of the Illinois Judges Association, while the association has sponsored the rest. “It is appropriate that Lincoln be honored. 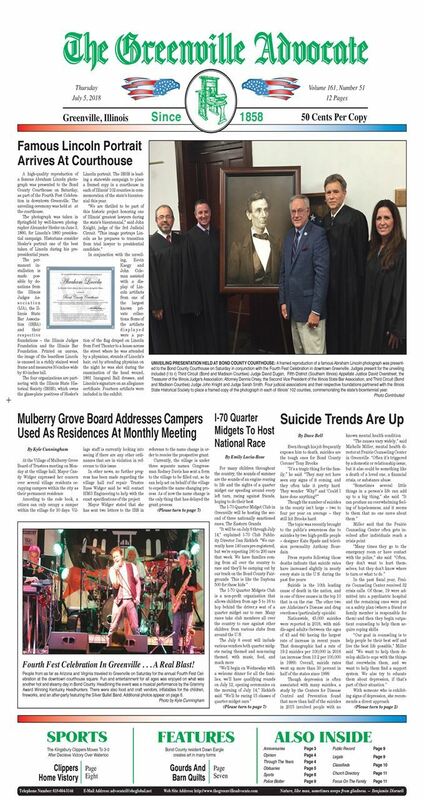 It's widely known about Lincoln and how he distinguished himself as a lawyer in the state of Illinois before he went to Washington as president,” said retired Judge John Coady, who began his legal career in Effingham. Coady said many don't know that Lincoln also served as a judge in Illinois. “The rules then were that if the sitting circuit judge was unavailable to preside, the parties with their attorneys could agree to a member of the local bar to preside over a case and serve as judge,” he said. Coady said Lincoln presided over 95 cases in downstate Illinois in 1858. Koester will participate in eight other ceremonies in counties across Illinois that have their own memories and contacts with Lincoln. Koester said she has another Lincoln portrait in her judge's chambers, along with several Lincoln quotes, because he has always been one of her favorite historical figures. “His leadership and deep insight that he showed during his years as a lawyer, as a politician and finally as our president is unmatched,” said Koester. Coady said this particular portrait came about after Lincoln was nominated in Chicago by the Republican party to seek the office of president of the United States. The campaign committee wanted a photograph of him, so he brought several with him. That's when they retained Alexander Hesler, a photographer from Chicago, for purposes of creating images for newspapers, buttons, posters and pamphlets. This was the first presidential campaign to use photographs, Coady said. Lincoln's honesty, integrity and commitment to the law are ideals that people still expect from lawyers and judges today, he said. Local historian Delaine Donaldson, who serves as the president of the Effingham County Cultural Center and Museum Association, noted local ties to the 16th president. Donaldson referred to a local tailor, Joseph Horn of Teutopolis, who repaired Lincoln's jacket, which had gotten torn while he was riding the circuit. That brought a long-time friendship between Horn and Lincoln. Donaldson said there are plenty of stories throughout history of the connections Effingham County residents have had to Lincoln the lawyer, the legislator, and the president. “Always in the county, there's been a connection, either directly or in terms of the mindset of this man, (Abraham Lincoln,)” said Donaldson. 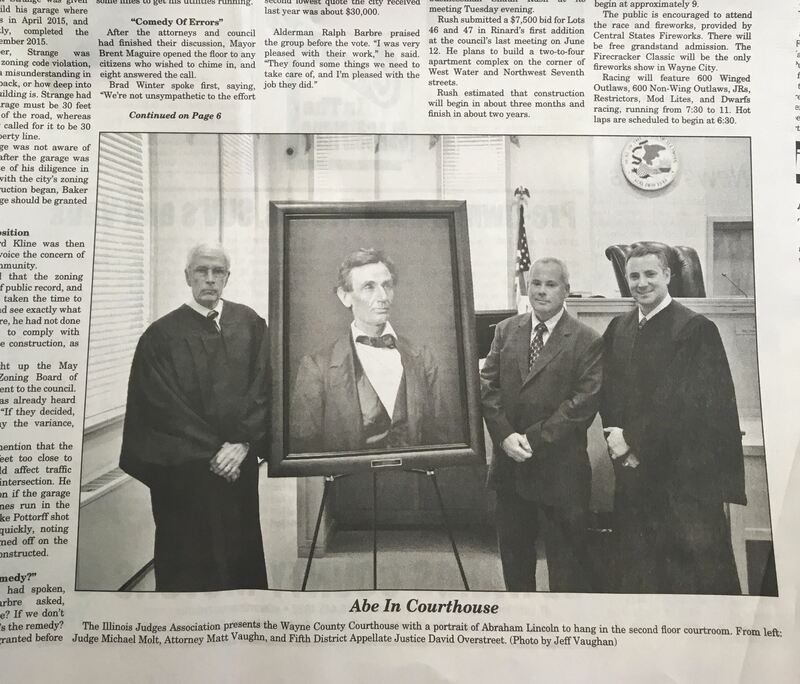 CARTHAGE, Ill. -- A high school class reunion made it possible for the Hancock County Courthouse to be the first in the 9th Judicial Circuit to receive a reproduction of a pre-presidential Abraham Lincoln photograph. Judge Debra Walker, a Carthage native who presented the high-quality photograph to Hancock County on Friday, said she had to push for an early date if she was going to speak at the ceremony. "I said it needs to be on July 6 because I'm going to Carthage on July 6 for my reunion," Walker said. A circuit court judge in Cook County, Walker said the portrait will be in public view "recalling Lincoln -- the lawyer, the leader and the man." The permanent installation is part of a statewide campaign to place a framed copy of the Lincoln photograph in the courthouse of each of Illinois' 102 counties for the state's bicentennial, the celebration of which officially begins Dec. 3. The photograph was taken June 3, 1860, at the Old State Capitol in Springfield by photographer Alexander Hesler for Lincoln's presidential campaign, and it is considered one of the best photos taken of Lincoln during his pre-presidential years. The Illinois State Historical Society owns the glass-plate positive image of Hesler's Lincoln portrait. The Historical Society partnered with the Illinois Judges Association, the Illinois State Bar Association, the Illinois Judges Foundation and the Illinois Bar Foundation on the project. Also in attendance at Friday's presentation was Illinois Supreme Court Justice Thomas Kilbride, who said Lincoln faced many losses throughout his life, both personal and political. "The fact that he persevered was remarkable, I think, with all the hurdles and challenges he faced," Kilbride said. Walker noted that Carthage was well-known to Lincoln because his childhood friend Alexander Simpson settled there. Lincoln spoke in Carthage on Oct. 22, 1858, as he campaigned for the U.S. Senate, which he eventually lost to Stephen Douglas. "After the speech that he gave 160 years ago, he was followed by a big group of people to his friend's home, so he spoke to them again from the doorway of the Simpson home," Walker said. "And I believe that doorway is one of the items in the Kibbe Museum that's here in Carthage." Lincoln also was hired to defend William Fraim, who was accused of murder in Schuyler County and was tried in Hancock County. Lincoln lost the case, and Fraim was the only client of Lincoln's who was executed. 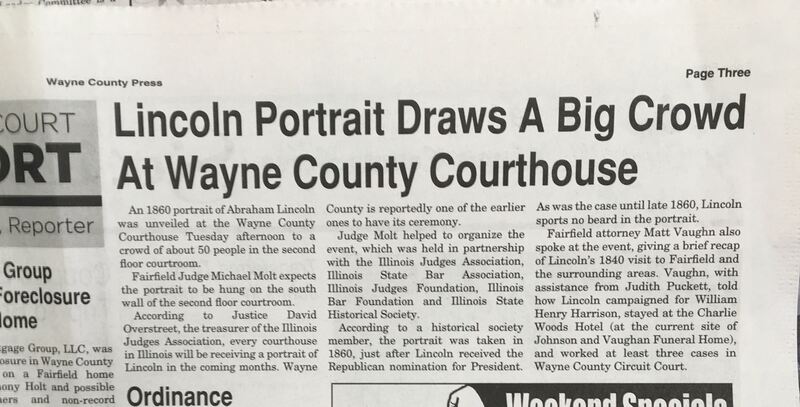 Link to news in the Kankakee Daily Journal about the Lincoln Portrait installation at the courthouse. Enjoy!